Calling all free hands! As you may know, the Moana occupation site was torn to shreds due to high winds. Many supplies and volunteers are needed (see previous post here). 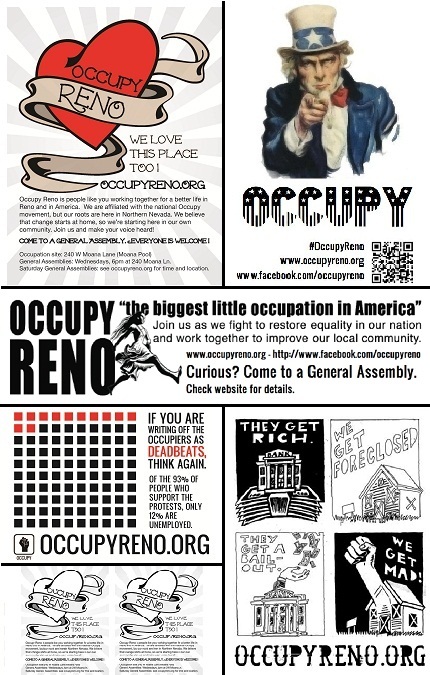 Temperatures are dropping too, so please join Occupy Reno as we work on emergency projects all weekend. We need your help! 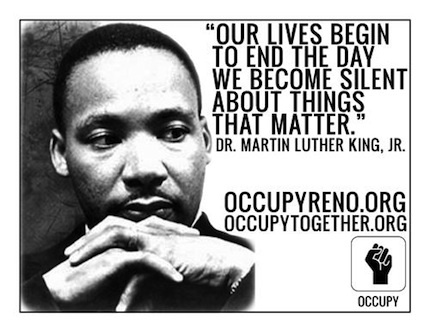 Posted on November 18, 2011 by mediaoccupyreno | Comments Off on NEW PLAN for SATURDAY! Today was definitely an eventful day. Our thoughts are with all those who were evacuated from the Caughlin Fire zone, and especially with those who lost their homes. Our occupation site is two blocks from the edge of the evacuation zone, and we’re incredibly grateful to the Fire Department and all those who fought the flames and kept us safe. Still, the high winds did some serious damage to our camp. Several tents were blown down, as well as our portajohn. Our water containers were destroyed. In light of today’s events, tomorrow’s march is CANCELED. We’ll still have our march on Black Friday itself, November 25. Tomorrow, however, we’ll all gather at 240 W Moana to work on fixing up the camp. 10:00am: Meet at 240 W Moana for a general work day. We’ll be relocating tents, making new signs and banners, improving the infrastructure and doing general cleanup. 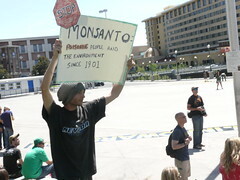 12:00pm: General Assembly at 240 W Moana. We’ve got some exciting and important things to discuss, please come take part in the conversation. 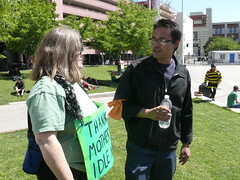 1:30pm: Representatives from Transition Reno will be on site to talk about how our organizations can work together. An important discussion for anyone interested in environmental issues and a post-petroleum society. Are you a night owl? Can you spare one night a week to help us watch over our camp? Some of our intrepid Occupants have been taking turns on the night shift, keeping the camp safe while everyone sleeps. Even if you can’t be here every day, volunteering for a night shift will make a huge difference. If you can be an overnight watchperson, come down to 240 Moana any time and talk to us about it. Comments Off on NEW PLAN for SATURDAY! Don’t forget to dress for the very cold and windy weather. See you there!